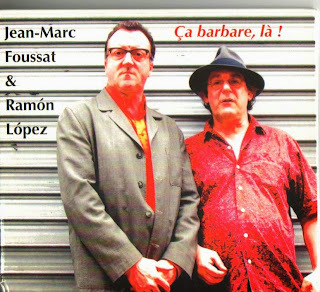 Gapplegate Music Review: Jean-Marc Foussat & Ramón López, Ça barbare, là! The jagged linearity of synthesizer and electronics soundscaped and interspersed with brief loops combines with freely imaginative drumming on the hard-hitting album Ça barbare, là! 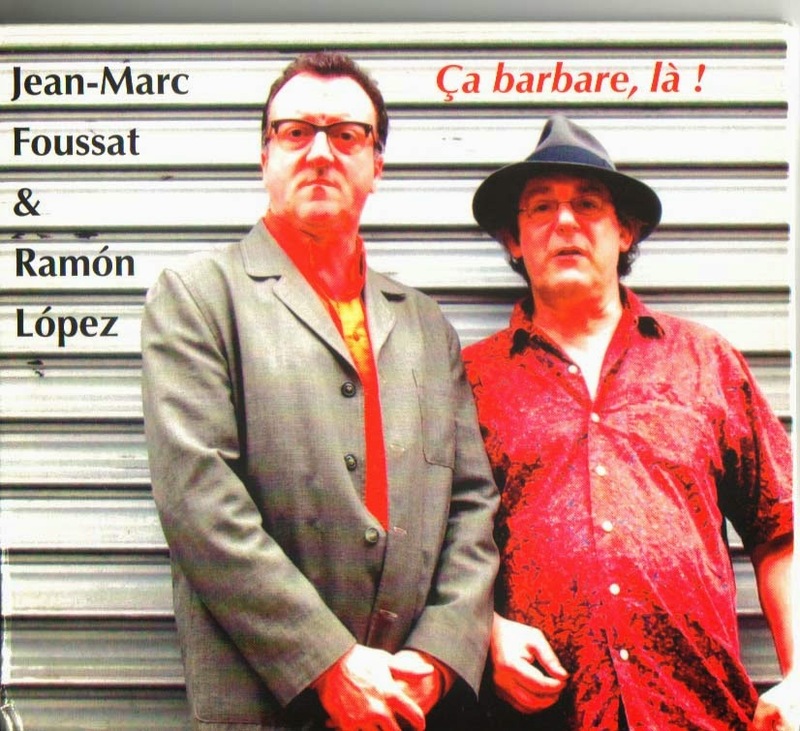 (Fou CD 04), by Jean-Marc Foussat & Ramón López. We have covered some of Foussat's inventive work in past months (type his name in the search box for those). This one has an especially spontaneous dynamic with the open-field experimental improvisations of Foussat manning the electronic array of sounds and Ramón López coming through with very appropriate free drumming via a full arsenal of percussive sound colors that he uses appropriately and creatively. The music has a DIY immediacy that does not hearken to jazz roots or what typically comes out of the new music area. It is neither as much as it is itself. And what that is perhaps is better heard than described. Or perhaps I should say that it is difficult to describe. There are music-noise events spontaneously generated with varying degrees of energy and intensity. The electronics give us widely differing sound poetry with continuous and discontinuous sequences that López counters with an assured sense of gesture. It is music that is experimental, yes, but not at all tentative. It is not at all formal sounding as much as it is human. And in the end it is the panorama of colors that beguiles and attracts. It has a more expressively direct than overtly abstract demeanor, meaning this feels like soloing, improvising in a personally idiosynchratic way. And for that is more akin to "jazz" than new music audio lab kinds of electronics (and I am thinking more of the electronics of the '60s composers when I say what it is not). After a few listens I found the entire album convincing. It is "out there" in the orbital sense and it is very much a mutually exploration of two like-minded pioneers out to discover themselves. So if you like uncharted experimental improv territory, this covers it well! Even with originality, as far as that word applies here (and it does). So listen.